Royal Brunei (Brunei Air or RBA) is the national luxurious airline carrier of Brunei Darussalam, a Southeast Asian country. Wholly owned by the government of Brunei, the airline operates direct flight connections from Australian cities such as Brisbane, Sydney, Perth and Darwin and its main base is at Brunei International Airport in Berakas, north of Bandar Seri Begawan, the capital city. The airlines also has other scheduled flight services to 21 destinations across Asia, the Middle East and Europe. The airline company was first established in the year 1974 and has maintained a good image in its first class comfort and service combined with delicious meals and of course non alcoholic drinks. 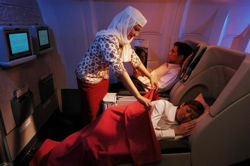 Usually, passengers in the economy class will also be treated well in order to give them a first class experience also. Royal Brunei Airlines flies to the following destinations worldwide : - Dubai, Hong Kong, London, Frankfurt, Bangkok, Denpasar Bali, Jakarta, Jeddah, Kota Kinabalu, Kuala Lumpur, Manila, Shanghai, Singapore, Surabaya and Brisbane, Darwin, Perth, Sydney and Auckland. Several airlines have signed a code share agreement with Royal Brunei Airlines and they are Singapore Airlines, Malaysia Airlines, British Midland, Philippine Airlines and Dragon Air of Hong Kong. The present Royal Brunei Airlines fleet consists of aircraft types of Boeing 767-300ERs, Airbus A319-132, Airbus A320-232, Airbus A340-300, Boeing 757-2M6 ,Boeing 767-33AER and Boeing 787-8M6. Business Class passengers enjoys the presence of the SkyDreamer beds which are electronically adjustable, given a priority check in, baggage tagged at airports and also exclusive sage of airport lounges such as the SkyLounge located at the Brunei international Airport. For Economy passengers, besides having rewarded with perks, they can also enjoy viewing on 8.4 inch personal TVs and on-demand entertainment. The SkyLounge at Brunei International Airport is a plush lounge reserved particularly and exclusively for Royal Brunei's First and Business Class passengers. Royal Skies Gold and Silver members also get to use this lounge which is equipped with many exciting facilities such as massage chairs, free internet workstations and wireless access, and also large plasma screen televisions. For Muslim passengers, there is a prayer room available. Lastly and also not forgetting is the wide selection of its complimentary food and beverages. 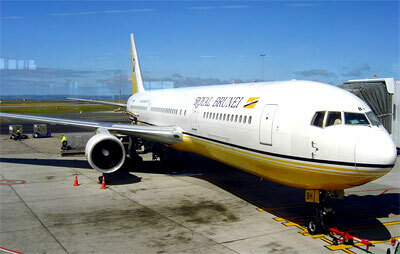 Check flight schedule, flight status directly from Royal Brunei Airlines official website. You can also check on the cheapest airfare, flight schedule, flight status, airlines offices, contact number, airlines packages, air cargo partners, air ticket prices and booking procedure, international airfares, frequent flyer and other flight information and travel deals and packages. When you are making an airfare booking, select from either economy airfares, business class airfares or first class airfares whichever you prefer. Have a pleasant flight journey and enjoy your holidays or business trip!